About to watch Dungeon, looks decent. I'm planning to watch that and Medicine. Let me know. The manga for Dungeon is mediocre. Also planning to watch it, but, besides the movie, I've not found Haruhi as spectacular as it is made out to be. The movie is great though. @Jatz knows. What was your old account? I don't remember you. That first episode was nice. 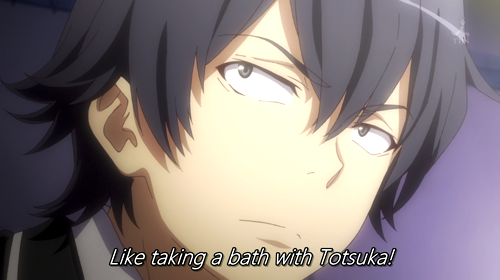 Maybe hachiman the giant **** won't be such a giant **** after all. It wasn't bad, but not really good either. Hopefully the second episode will be better. I intended to give Food Wars 3 episodes, I couldn't give it more than 3 minutes. I heard that was dumb as hell, but I have it reserved for many anime challenge under "Watch an anime that is tagged with a genre you dislike". Seems fitting. Yo so I'm out of shows I'm watching and wanna watch a decent anime. Most of my experience is in the cyberpunk or action or space western area so maybe something that's easy and on earth and just kinda light? Sara? Mike? 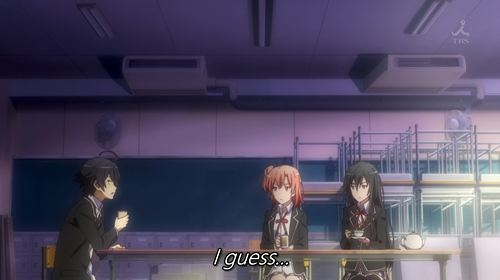 Like Clannad, but not sad as hell? Great Teacher Onizuka is worth a look. As a whole it's kind of a mashup between slice of life, school, coming of age, comedy, dramedy, a bit of shounen here and there....got a bit for everyone. Kinda crude at times but compared to todays fanservice it's relatively benign. Beck was nice and a big fave of mine. It was about a teenager joining an indy band and their struggles to make it big. Pretty grounded save for the Lucille story. Got lots of ups and downs emotionally but it definitely ends on a very big high. 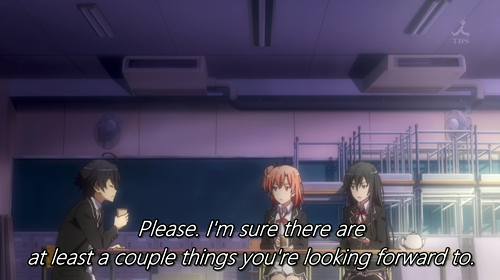 My Teen Romantic Comedy SNAFU is a recent, fun-ish lighthearted earth show. Somehow avoided the cliche stuff despite the shows premise being the very definition of a premise. I've got a fair few grounded earth shows on my list but a lot are either dark, action heavy and/or extremely violent. I'll have to check some out. Thanks. Nagi no Asukara - romance story not totally devoid of sadness, but still enjoyable (one of my favorites) and really nice to look it. The latter two aren't exactly grounded in reality. The first is obvious, the second involves two villages one coastal and the other in the sea. Oh yeah Nisekoi's supposed to be good. That reminds me, I've held off on DLing Nisekoi due to it being unclear which version I'm supposed to get. From what I can tell the Blu-Ray version had issues with cropping, removed backgrounds, random censorship additions and subtractions etc making the TV version is actually more complete than the Blu-Ray. Should I go after the HorribleSubs 1080p TV rips? Higashi no Eden: A group of 13 called the Selecao (yeah like the Brazilian national team) are given phones with access to 10bil yen to change the world, a girl runs into one of them who's now amnesiac. Robotics;Notes: a class science club decide to built a IRL mecha robot because they're fans of the real thing in anime. A Certain Scientific Railgun: Spinoff from a Certain Magical Index that IMO outdoes the main show. set in a city where superpowers are extremely common...follows the life of a student who happens to be the #3 in terms of power. Best story is Accelerator that takes place in season 2 but it's arguably not easy viewing as there's some very graphic deaths.